Hi, I am Gu, nice to meet you :) I am a product/UX designer based in Stockholm. 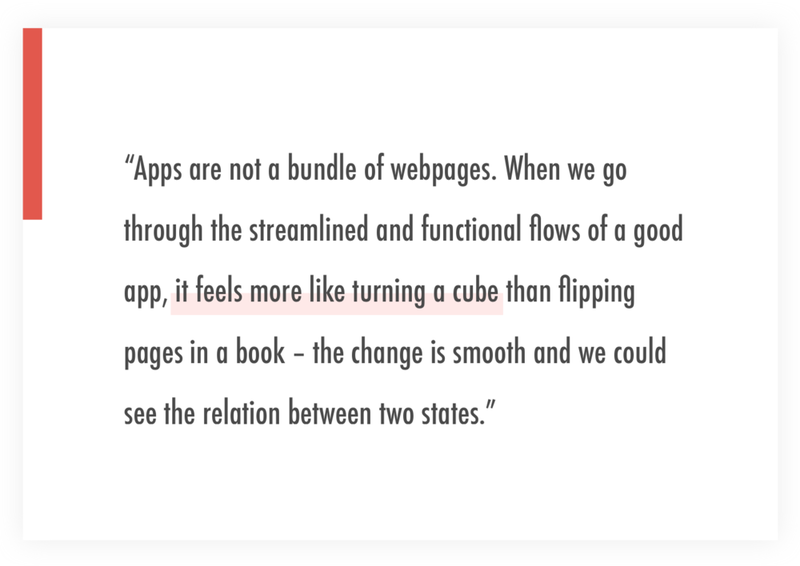 Above is a key realisation when I transitioned from designing for web to designing for mobile apps. But the journey getting there was a winding one. My first design project was my personal website built during my graduate school years at KTH. The site has my photos, trips, journals and even singing recordings and it ended up attracting 18 MILLION visits. This was 14 years ago, before the invention of iPhone and Facebook. After getting my first master's degree in IT when I went to pursue another master in Art and Technology, at the mean time, started my own company to build my own design career. Starting a business in a new country with zero existing network was not an easy task. The contrast became so stark when most of my KTH classmates went to have comfortable well-paid cooperate IT jobs at Ericsson, DHL etc, and I had to struggle so much to make the business afloat. As hard as it was those years, I had the knowing that design was my calling and I just couldn't give it up. The more designs I did, the easier it became. Almost only through word of mouth, my client base grew gradually and organically. I even managed to acquire quite some high profile clients like Spike Edney (keyboard player of Queen) and top art galleries in London, Stockholm, Milan and Beijing. This was before the mobile hype, even if the freelance career was working, I still couldn't truly relax into believing that I could live on design comfortably. So I made the choice to try the Chinese Art business in London. After working in Christie's and building a valuable network of world-class dealers, I decided to give it up because I didn't feel it was my calling. Then I made another choice to liaison between Sweden and China by selling wooden villas from Sweden to China. After closing a 20 million kroner deal, I was asked by a company with 3 billion turnover to be their sole agent in China. The financial future looked so bright, but I chose to quit. Again, I just couldn't give up my design. I suppose this is how life works. Only when you dare to give up the things you don't truly want, the things that are meant for you will have the space to show up. One month after I quit the wooden villa business, when I went back to the state of feeling both insecure about the future and firm about the direction, I met Niklas, the founder of Instabridge, at a random hackathon and the whole design career trajectory got dramatically changed. I became part of the founding team to build the product from scratch, 3 times. It was years of blood sweat tears. In the midst of the Instabridge struggle, I lost my most beloved mother. In order to save myself from the soul-crushing grief, I was left with no choice but to dig deep into psychology and learn about how the human heart and mind works. Now, I have come back to life with full passion and Instabridge is used by millions of people every month globally, backed by investors like Tim Draper (early investor for Tesla, Baidu, Skype etc.) and Creandum (early investor for Spotify). I still remain a shareholder of the company but went on to pursue a consultant career to make more apps great. The best part coming out from such a journey? Finally, I can relax into the idea that I have made it to be a true digital designer, and life is sweet this way.